Rhetoric is among the most important and least understood elements of presidential leadership. Presidents have always wielded rhetoric as one tool of governance—and that rhetoric was always intended to facilitate political ends, such as image building, persuasion of the mass public, and inter-branch government persuasion. But as mass media has grown and then fragmented, as the federal bureaucracy has continued to both expand and calcify, and as partisanship has heightened tensions both within Congress and between Congress and the Executive, rhetoric is an increasingly important element of presidential governance. Scholars have derived ways to explain how these developments and the presidents' use of rhetoric have contributed to and detracted from the health of American democracy. This briefing book offers a succinct reflection on the ways in which historical developments have encouraged the use of political rhetoric. It explores strategies of "going public" to provide some leverage over the political system and the lessons one might derive from these choices. This essential analysis, written for lay readers, scholars, students, and future presidents, is the first in Transaction's innovative Presidential Briefings series. 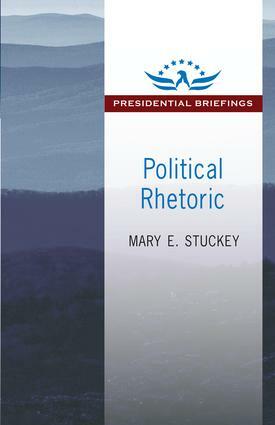 Mary E. Stuckey covers the scholarly literature with authority and offers examples of rhetoric that have lasting influence.